Hey guys, I have to study for a test/write a paper/work on stuff I’m getting paid for/not sleep, so I decided to show you this commission I just finished! It was for Zestymoo, who wanted me to draw the main trio eating strawberry cake while wearing party hats! Everything else was an embellishment. A commission, you say? I bet those are prohibitively expensive from someone as “talented” as Alter! Wrong! I will draw you something for SO CHEAP! Help me out so I can eat food like these guys. Hopefully there will be regularly-scheduled comic fun on Wednesday. I really hate shoving the “GIVE ME MONEY” in your face, but I just wanted to make sure you know. Because I’m broke, dudes. But a lot of people are, so please just enjoy this cute picture. Oh! Yellow + Blue = Green. … I can’t believe Skärva would eat a strawberry cake. That’s not what I was going for, but yes, that is true! He just didn’t seem the strawberry type to me. their hats match their magic color. He is ALWAYS stealing their food! How does he expect to keep his job? …Well, by not getting caught, I suppose. FUN FACT: Historians are not entirely sure if Ms. Antoinette ever said. “Let them eat cake”. I want cake now. I havent even had breakfast and I want CAKE DANGIT. GIMME SOME CAKE. They are celebrating someones cakeday maybe? Yeah, the historical circumstances around the famous “quote” are usually misunderstood and wrongly attributed. BUT I like the French Revolution. if you truly are strapped for cash, I would suggest putting ads on the sidebars perhaps? You know, like the big long kind advertising for other comics like Awk Zomb and MSPA have. I wouldn’t mind seeing them if it meant supporting the artist/such a great comic. Aww, thank you so much Well, we do have our little ad, but it’s to help spread the webcomics goodwill more than anything… the thing is, we don’t get enough visitors right now for ads to rake in any notable profit. Hopefully some day, though! 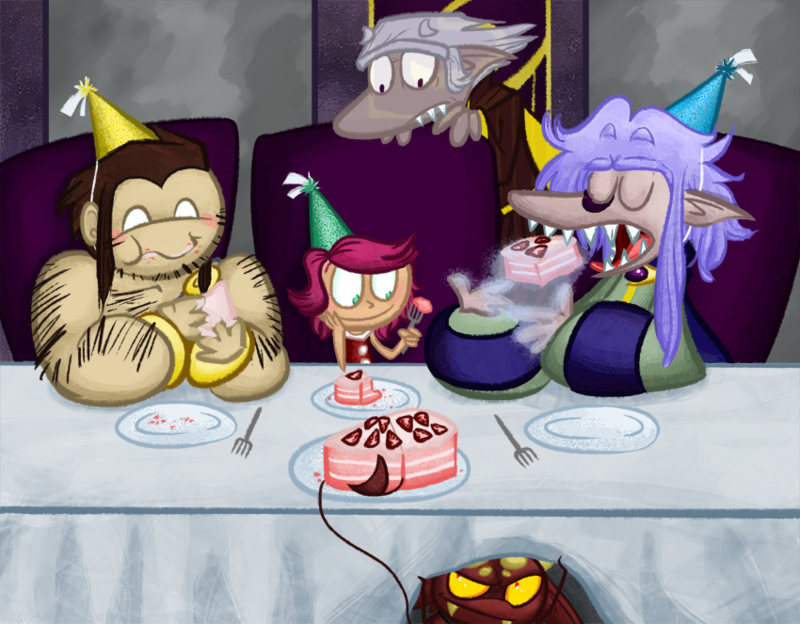 I love how Skärva is using magic to eat his cake. Egads, I have not commented in some time. I’m still here, I promise. Also, I can relate to this, because this morning I made pink lemonade cake with strawberries on top. It was very delicious. Good thinking, Skärva. Now your hands won’t be sticky. Hi! :3 That does sound yummy! Maybe Skärva is afraid to get his fingers near his own mouth. Just in case. Waaaaaaiiit a minute… Why does Skarva have teeth WAY out there? WHen his mouth is closed, that’s just snout. Do his teeth like curl out like a snake? ‘Cause that goes from a plain curse to a work of horror. Well, I was just going to say, artistic license and inconsistencies for the sake of effect, you know… but I like your idea so much better. Second, I find it amusing that Lorelei seems to be admiring her piece of cake. In all fairness, pink -is- a good colour for cake. Pros: You get to fly, no more being hungry. Cons: No cake. Strawberry cake was actually specified by the commissioner! So thank her! Well, of course. Demons were made to do this kind of thing. Literally.